A man killed a woman in Faisalabad late Saturday night. The woman’s family told the police that the suspect had long been pressuring her to marry him. CCTV camera footage of the killing has gone viral. The murder happened earlier this week at Kohistan Daewoo Terminal. 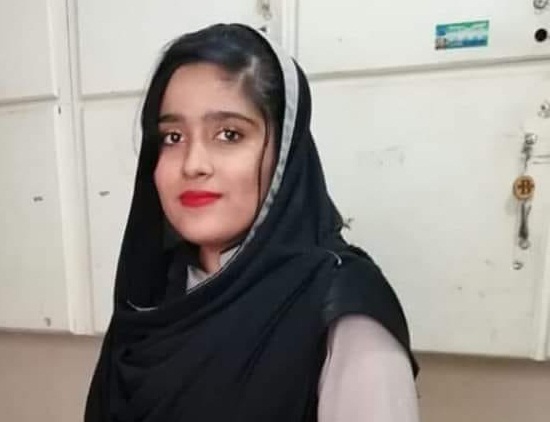 The deceased has been identified as 18-year-old Mehwish. Her family registered a case with the Sargodha Road police station. The FIR says Mehwish worked for a bus company. The accused, Umar Daraz, had also worked for the company as a security guard for the company. Relatives of the deceased told the police that Mehwish often told them about a man named Umar Daraz, who would pressure her to marry him. On June 9, she had arrived at the terminal from Multan when the murder happened. The CCTV video shows the attacker cornering her on a flight of stairs. He holds her by the arm, has an exchange of words and then opens fire. The woman dies on the spot. Daraz is in custody. Investigations are underway and a post-mortem is due. Earlier in January, a man killed a medical student in Kohat for turning down his marriage offer. In her initial statement given at the hospital, Asma had identified Mujahid Afridi as the person who had fired at her. Lawyers in Kohat refused to take up the case as the accused, Mujahid Afridi, belonged to what they described as a powerful family.